Monster cookies cleaned up and put into muffin form! 1. Mash 2 ripe bananas. 2. Add 1/4 tsp baking powder, 1/4 tsp cinnamon, a dash of salt, 2 Tbs pb2 (can sub regular peanut butter) and 2 scoops of vanilla whey protein powder. Mix ingredients together until batter is smooth. 3. Add 1 egg and 3 Tbs of liquid egg whites and combine. 4. Next, add 1.5 cups of rolled oats and 3 Tbs of dark chocolate chips. Combine until oats are covered in banana mixture. 5. 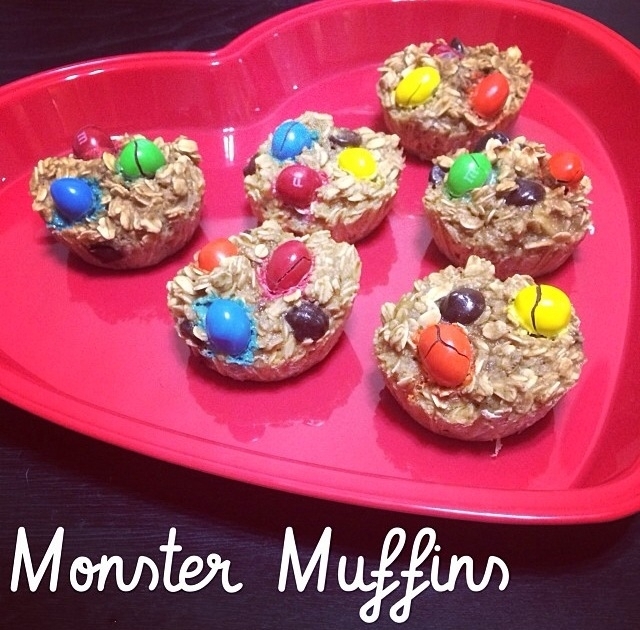 Pour batter into sprayed muffin tins and top with a few m&ms! 6. Bake at 350 F for 15 minutes and enjoy!